CoinInvest.com is delighted to offer its customers a wide range of minted and cast gold bars produced by Heraeus, an LBMA approved German refiner that is known for high-quality products. The 1 g Heraeus Kinebar is the perfect introduction to the magical world of precious metals and these elegant bars make thoughtful gifts. Like mint and cast bars, each 1 g Kinebar contains .9999 pure 24 carat fine gold. However, each bar also has an additional security feature in the form of a holographic image or 'Kinegram' on its reverse. This attractive feature makes Kinebars particularly appealing to both new and established investors. Furthermore, all 1 g Heraeus Kinebars are supplied in a tamper evident blister with a certificate of authentication and a unique serial number. It couldn't be easier to buy gold bars at the lowest prices possible. 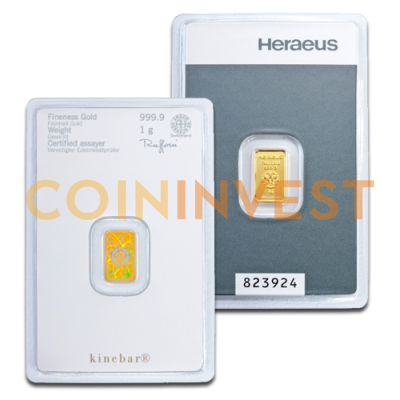 CoinInvest.com offers its customers a wide selection of investment bars including this exciting Heraeus 1 g Kinebar. We buy in bulk in order to keep our prices low and the Kinebar is an excellent way to start or add to your fine gold collection.